Perhaps nothing better illustrates the intellectual stagnation of this period than the life and career of Gerbert d’Aurillac. Gerbert d’Aurillac was a French cleric and scholar who lived from 946-1003. He was born in the town of Belliac and in 963 he entered the monastery of St. Gerald of Aurillac. His intelligence impressed the abbot of the monastery and when Count Borrell of Barcelona visited in 967, the abbot asked the count to take Gerbert with him to Spain so he could study mathematics. At this time Spain was divided between the Muslim Umayyad Caliphate and the Christian Franks, like Count Borrell, who owed nominal allegiance to France. Moslem Spain was experiencing a golden age of learning in philosophy, natural sciences and mathematics and Gerbert eagerly learned all he could from both Christians and Moslems. In 969, Count Borrell took Gerbert with him to Rome where he met Pope John XIII and the Holy Roman Emperor Otto I. Otto hired Gerbert to tutor his son, the future Otto II and later allowed Gerbert to study and then teach at the cathedral school at Rheims. Gerbert took back to Christendom the learning he had acquired in Spain. He introduced arabic numerals to Europe, though they didn’t catch on until the time of Fibonacci two centuries later. He also reintroduced the abacus, which had been lost in Europe since the fall of the Roman Empire in the West, along with astronomical equipment and learning, including an astrolabe and he constructed an organ powered by hydraulics. He became the foremost scholar and scientist in Christian Europe. He experimented with building mechanical clocks. Naturally, there were rumors that Gerbert dabbled in sorcery. He was supposed to have a bronze head that could answer questions put to it. Some said he had learned more than mathematics and astronomy in Spain. He was also said to have learned forbidden arts and to have made pacts with devils. So, what happened to this scholar in the Age of Ignorance and Superstition. Was he burned at the stake for witchcraft? Defrocked and expelled from the clergy? Executed as a heretic. No, they made him pope. 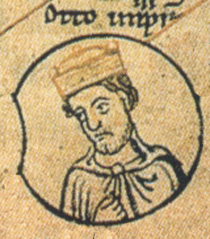 Gerbert d’Aurilac reigned as Pope Silvester II from 999 to 1003. He did not get to be pope because of his scholarship, to be sure, though his intellectual reputation did help. Remember that he was the tutor to the Holy Roman Emperor Otto II. Otto II thought much of Gerbert and made him the abbot of the monastery of Bobbio. This did not work out well so Otto gave him other posts, including tutoring his son Otto III, who reigned as Holy Roman Emperor from 996 to 1002. Otto III was only 16 when he became emperor, but he already had big plans to restore the Roman Empire to its former glory. As part of his dream, Otto III patronised learning and helped the careers of men like Gerbert. Unfortunately, because he took the Roman part of Holy Roman Emperor seriously, he tended to interfere in Italian and Roman politics and to neglect his German subjects. Pope Gregory V was Otto III’s cousin so he made Gerbert Bishop of Ravenna and when Pope Gregory died in 999, Otto thought he would be a natural choice as pope and used his influence as Holy Roman Emperor to get Gerbert the job. Gerbert took the name Silvester II, after Sylvester I, who had been pope during the reign of the first Christian Roman Emperor Constantine. If Otto III wanted to restore the Roman Empire, than Gerbert would play the same helpful role that Sylvester I did with Constantine. Sylvester III wasn’t a particularly successful pope. He Romans resented Otto III for his interest in Italian politics and they disliked having one of his associates imposed upon them as Pope. The Romans viewed Sylvester II as a low-born foreigner and rebelled against him and Otto III in 1001. Sylvester II was obliged to flee to Ravenna. Meanwhile Otto III died in 1002 while campaigning in Italy, his dreams of restoration unfulfilled. Sylvester II was able to return to Rome, but he died the following year. His legacy turned out to be more lasting than his patrons as he had helped to inaugurate the revival of learning in Europe that became known as the High Middle Ages. I hope the story of Gerbert d’Aurillac aka Pope Sylvester II will help to put to rest the idea of the Christian Dark Ages. The learned men of Europe were aware that they had fallen behind the Muslims of Spain and had lost much that was known in ancient times. They were not proud of this ignorance nor were their minds on strike. They were trying their best to learn what they could from others. It is curious that when the Europeans began to make contact with other civilizations, the Muslim world, Indian, China, for the most part these other peoples were not very interested in learning about the, by then, superior technology of the Europeans. Perhaps it was this curiosity and willingness to learn from other cultures shown by men like Gerbert d’Aurillac, that caused the West to pull ahead and become the most advanced civilization in the world. ISIS Declares That They Will Invade Jerusalem, The Vatican, And Spain, And Destroy the Christian Cross. (shoebat.com) And some of us really are in the Dark Ages.